Out of My Mind By Sharon M. Draper​. Do you ever feel like you’re going out of you mind? Feel like you’re stuck in your head? Well that’s exactly how Melody feels in Out of My Mind by Sharon M. Draper​. Melody is a smart 11-year old girl who was born with a disease that disables her to walk and talk. But that does not stop her mind from working. Melody is so loved by her family and Mrs. V but not so much by the rest of the world. Out of My Mind, pulls you in and you can’t help but love and feel bad for Melody. The struggles she goes through on a daily base is heartbreaking. Find out what is in Melody’s head in Out of My Mind, by Sharon M. Draper​. Out of My Mind by Sharon M. Draper, was an amazing read. I read it in 3 days and could hardly put it down. Out of My Mind could interest people of all ages! This is a book I think everyone should read. You can easily relate to Melody. She is a sweet kid that just wants to be normal. Sharon M. Draper writes in the mind set of someone like Melody so well. She really is an amazing writer. I will definitely be reading more of her books. 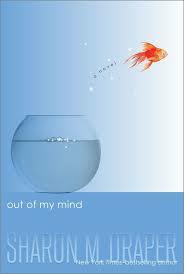 If you are looking for a great read, I would suggest Out of My Mind by Sharon M. Draper. I would give this book a 9 out of 10.